Home / News/Blog / If you love us, let us know! Ward Black Law is in the running for the GoTriad 2016 Reader’s Choice Awards, and we would be honored to receive your vote. For years we’ve been serving the Greensboro area with unparalleled availability, honesty and exceptional client service. If we’ve served you well, please vote for us by 11:59 p.m. on Sept. 30 . When you do, you’ll also be entered to win a $100 or $200 Visa gift card! Voting is easy, and it only takes a few moments! 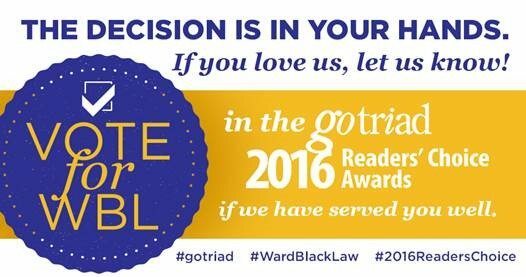 Just check out the rules and follow the steps on the GoTriad 2016 Reader’s Choice Awards Web page. Happy voting, and thank you from our team at Ward Black Law!